If your site is using https and doesn’t have a valid certificate, then switch it to http while setting up Mailgun. Don’t forget to switch the site back to https and update the route when you have finished. 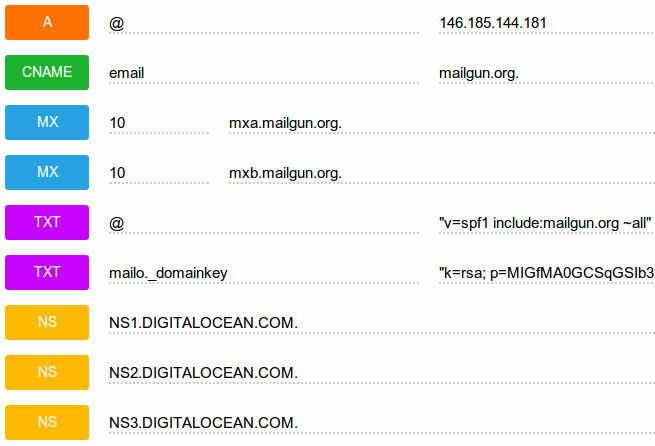 If Mailgun asks you to create a TXT record with your domain name appended e.g. k1._domainkey.hatherleigh.info, then the name should be entered without the domain name e.g. k1._domainkey. As shown above, append /mailgun/incoming/ to your domain name. Make sure you include a mailgun_access_key somewhere in your pillar. In your Salt pillar for the site enable mailgun_send. Check the mailgun URL for your site (appending /mailgun/incoming/ to the site URL). See Process for notes on how to check incoming mail.